Having struggled against each other in a bizarre quest for ultra sophistication, the Japanese manufacturers have rediscovered the importance of making bikes that are both simple and affordable. 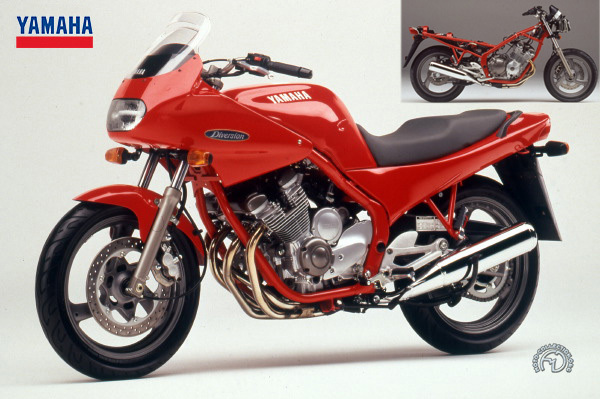 Among the latest on the scene is the Yamaha Seca, which went on the market at the end of 1991 at a seemingly unbeatable price. About 30 percent less expensive than rival 600cc four-cylinder "Super Sport" bikes, the Seca II (named Diversion for Europe) is still not a cheapskate machine. It just omits unnecessary features and complex technology. There is no integral fairing, no cast- aluminum frame, no liquid cooling, no multivalve head. That doesn't prevent the Seca from being up-to-date with an entirely new power unit, forward- inclined in a modem tubular frame to improve the weight distribution. Even though its maximum speed is a perfectly respectable 120 mph or so, the Seca is not predominantly an out-and-out performance machine. It is basically a highly practical bike that calls for a minimum of maintenance, is light and easy to handle, and just as comfortable two-up as solo. It happily meets its design parameters in being that rare animal - a multi-purpose road machine. Its styling is just right for its function, sporting without being aggressive, modern without aping racing bikes or copying the classics of the past.